The ballasts are the most important component of an HID kit, as they provide the power. After years of providing midrange and even high-quality ballasts for vehicles of all makes and models, Diode Dynamics identified a company called HYLUXTEK as the very best manufacturer in the industry. Their newest ballast, the 2A88 slim, is simply the best aftermarket ballast on the market. You will see other high-end retailers carrying this same ballast, usually under their own brand name, for a much higher cost. Controller Chip. Most digital (DSP) ballasts on the market still use generic chips, which are cheap, and work pretty well. However, when you need maximum quality, you need a new computer chip designed for one purpose. This is known as an Application-Specific Integrated Circuit (ASIC). These ballasts use brand new DSP ASIC chips for maximum efficiency and brightness, fast warmup time, and extremely stable operation. To prevent counterfeiting, HYLUX has even included a fully-sealed transparent window in the ballast, showing the ASIC inside. CAN-BUS. Some vehicles have systems which sense the power consumption. Since HIDs use less power than factory halogen bulbs, this can cause issues. You can resolve this by adding capacitors, known as warning cancellers, or some ballasts come with them built-in. However, sometimes that's still not enough to trick the vehicle! To fix it, this ballast has an industry-leading CANBUS module, capable of smoothing PWM signals up to 100hz, and providing feedback to the vehicle to equalize the load, to defeat even the most troublesome modern CANBUS systems. Even if your vehicle does not use a CAN-BUS system, these modules will provide extra power smoothing for reliable operation. Simply put, this ballast will work on any vehicle, the first time you plug it in. With this kit, you don't need to worry about capacitors, warning cancellers, or resistors. Case. These ballasts are the smallest you will find, about the size of a pack of playing cards. The case is fully potted, or filled with epoxy, which makes them fully waterproof and shockproof. This material is expensive, so most ballasts on the market are only given a coating, or partial fill. HYLUX ballasts are completely filled to the top, sparing no expense to ensure longevity. If you take off the back cover on this ballast, you'll see what we mean! The bulbs included with Diode Dynamics kits are CNLight bulbs, which are widely regarded as the most dependable aftermarket bulbs on the market. Just like the HYLUX ballasts, you will see other companies offering these same bulbs under their own brand name. 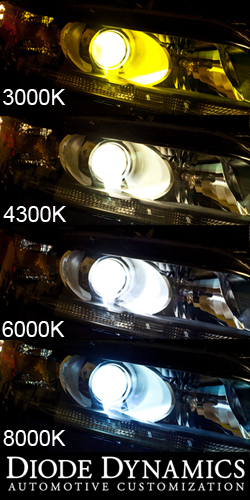 They provide superior life, brightness, and color attenuation when compared to generic HID bulbs, like those found in most cheaper kits on the market. With these bulbs you won't have any issue with bulbs not matching in color, or flickering, which is common in cheaper bulbs. The one-piece base design prevents any issues with separation over time, making the entire bulb extremely reliable.